research methods module. This was a prerequisite before the module could be developed for e-Learning. 3. The move from a face-to-face on campus environment to a web-based off campus approach, and how this was actually developed for the web. The background to this development was the decision by the School Board of the Caledonian Business School (CBS) in 1999 to move to a framework undergraduate degree programme. Consequently, within individual degree programmes framework modules now represent 100 credits at level one and 40 credits in the following 2 years. In the honours year (level 4 in Scotland), there is a 40 credit generic module descriptor for the final year dissertation. The full framework is illustrated in figure 1.
the Division of Management. Two modules however are academic ‘orphans’ – Business Research Methods and the Dissertation module. This following sections outline how the first of these modules was developed from a simple name in a box to a fully operational eLearning module. 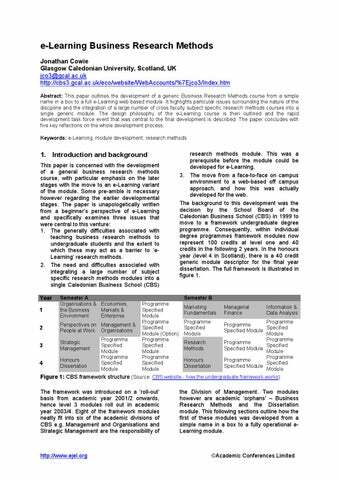 2. Business research methods Early module development Early development took the form of a short life working party under the leadership of the CBS Director of Research. This consisted of five members including the author. The broad remit of the group was to write a module descriptor for validation for a single RM course that would replace all existing RM courses within CBS. The descriptor therefore had to satisfy the ‘research training’ needs of each academic division within CBS. The biggest problem for the group was to produce a module that would provide an appropriate balance between generic research issues, quantitative research methods and qualitative research methods. The broad philosophy taken was to offer mini units in basic research principles as ‘core’ and more method driven specialisms as ‘electives’. The final module descriptor therefore split the subject into eight mini units with two being core and programme boards asked to nominated three from six electives. The original units were: ! Core elements – o Philosophies of understanding and research o The research process ! Elective units – o Data gathering and secondary analysis o Interacting with people o Advanced qualitative techniques o Surveys and the survey process o Identifying differences o Identifying effects The module was to be assessed through a written examination and a research project proposal. This latter assessment element was viewed as particularly important as it would be carried through into the dissertation at level 4. On reflection, the module was considerably under developed at this stage, particularly in two areas. Firstly, it had been designed in an ideal world situation, and little thought given to how it would actually be delivered. Secondly, the third year of the BA Business Studies constituted an industrial placement. In order to incorporate this degree into the framework, the ‘value’ of this placement had been reduced from 120 credits to 80 credits. The other level three framework module, Strategic Management, had ‘easily’ been incorporated by requiring students to submit a 3000 word report on strategic management issues arising on their industrial placement. As regards Research Methods, this was to be done ‘On the Web’. This was sufficient to resolve this particular problem and the module was subsequently validated. As a consequence of this underdevelopment, the author submitted a proposal to one of the general CBS funds for a grant to develop the module into a fully fledged course. This was approved with the proviso that an off-campus version of the module be developed for the BA Business Studies students on placement. The first part of the development was to redraft the original module descriptor into something that could be delivered to students, particularly in an e-Learning format. This was achieved by merging the two core mini modules into a single core element, and merging the six optional units into three elective streams – quantitative, qualitative and mixed. The author’s considerable experience of undergraduate project proposal development had shown that most students undertook honours projects that were a mix of quantitative methods (particularly surveys) and qualitative methods (mainly focus groups and in-depth one-to-one interviews). This revised structure was passed by the Research Methods Subject Quality Group and is shown in Figure 2. This revision only required some minor tweaking of the original descriptor. Importantly however, this gave some initial thoughts on how the module would actually be delivered and thus a basis from which the on-line module could be developed. Decisively however, the module was due to be delivered to campus based students from February 2004, but from October 2003 to off-campus students. It was therefore decided to develop the off-campus version first. actually very applied in nature. For example whilst general principles of good questionnaire design can be outlined, in reality each questionnaire is designed for a single purpose. This can cause a problem of relevance to the student, as relevance only comes through doing. Thus much of the learning environment is concerned with the formation of expectations as to the type of issues that may arise in the course of undertaking research rather than real world research problems. The particular challenge associated with teaching research methods to undergraduate students are well known to those involved in facilitating such modules and need to be carefully considered when developing research methods for an e-Learning delivery mode. These problems can perhaps best be summarised in the title of Benson and Blackman’s 2003 article ‘Can research methods ever be interesting?’ and reflected in the general consensus amongst RM tutors regarding such courses. This is that the student experience can be very disorientating, particularly when faced with terms such as ‘phenomenology’ and ‘epistemology’. There is a real danger that after undertaking such a module students can be left with the feeling of ‘what was that all about?’. As such, the course has failed to stimulate much interest in the student and business research concepts are something to be avoided in the future. Unquestionably this is partly because research methods courses cover a broad spectrum of academic disciplines and personal transferable skills that were previously unknown to the student. This usually begins with issues such as ‘how do we learn?’, quickly passes through weighty philosophical debates, moves on to practical skills such as literature searching, and somewhere along the way includes a course in basic statistics. The final part of this epic is to teach basic writing skills that are required in the presentation and analysis of research results. Underpinning these generic issues are four specific factors that also make teaching RM problematic. The subject has developed from what are fairly weighty academic debates about how research should be carried out. Whilst these issues are unquestionably relevant at higher levels of academia, the relevance for undergraduate dissertation students is less apparent. Owing to the highly academic nature of the discipline, the language associated with the subject can be fairly weighty and certainly distracts from the concepts being considered. It is also the case that most business research methods have been ‘adopted’ from the social sciences, and as such many aspects remain considerably underdeveloped in a business discipline context. Ethnography is an excellent case in point. Few, if any, texts explain satisfactorily the relevance of this methodology to undergraduate business students. A further barrier is that there is a distinct reluctance to admit this lack of development, hence such ideas and concepts are presented as the finished article, whilst in reality they are not. A third problem is that everyone has an opinion and in many cases an entrenched view on what should be taught in a research methods course. This ranges from the diehard positivist to the deep-rooted constructivist and all points in between. The problem is exacerbated for the RM lecturer because the ‘products’ of their labours are served up across a wide range of colleagues through honours dissertation supervision. The student can therefore become further confused as project supervisors advise differently on research issues. Electronic Journal on e-Learning Volume 2 Issue 1 (February 2004) 51-60 engrossed with the language of the discipline, which makes for weighty reading and bombards the student with difficult terms. The other is overly wordy, and whilst informative is not very useful. Using the literature review as an example, it explains what it is but not why it is a good thing to do and what you actually do with it. 4. Existing web resources on research methods At the beginning of this exercise there was a general conception amongst staff that there was masses of material already on the web that could be employed in our own resource. In order to uncover this material, due to the high degree of cross over in all social science based research methods courses, the search was not restricted to purely business areas. Given below in Table 2 is a partial overview of five of the resources they were found and evaluated. This evaluation was undertaken from a beginner’s perspective of what was believed to be important in the design of a website for e-Learning. All of the table headings are self-explanatory, but it should be noted that this review included other headings such as inter-activity and the extent to which the website created the sense of an on-line learning community. Content is brief, and lacks depth. Is described as a library of resources, but is effectively a very short online book. Colleagues at other institutions have commented upon the extensive nature of this resource. For our own purposes however, i.e. a fully off-campus eLearning course, whilst the breadth and depth would appear to be appropriate, the content is introductory and supplemental. May be useful however in a blend learning approach. This site is limited in scope as it is mainly concerned with information retrieval skills. Whilst ‘billed’ as an on-line tutorial, the approach taken is more consistent with a strictly distance learning approach. Does however contain some useful links to on-line material. This is an extensive source for on line reading materials on many aspects of the different types of research methods and methodologies that are employed within the business disciplines. In terms of developing our own resource, this provided useful access to supporting materials but provided little in terms of ‘e-Learning’ i.e. lacked interactivity. Despite being referred to on the front cover, this website was very disappointing. Consultation with the publisher’s representative however, revealed that this is the major aspect of the text that is to be further developed. 55 could be used to provide off-campus students access to supplementary reading. No quick fixes or even catalysts however were provided from this exercise with regard to actual eLearning and no further progress made towards development of our own resource. 5. Design philosophy of the eLearning component One of the advantages of the lack of appropriate web materials was that when it came to designing our own website the development team could start with an uninhibited view of what we wished to achieve from it. The development team were also very aware that for our own resource we did not wish to create something that was simply a case of electronic page turning (Forsyth, 2001). A further advantage at this stage was that GCU has adopted the Blackboard virtual learning environment. Armed with the knowledge of a few simple commands therefore, actually ‘putting it on the web’ was not a major issue. Jonathan Cowie In terms of the overall philosophy of the design of the e-Learning form of this module, an important element was the structure of the Business Studies degree at GCU for which this variant was specifically aimed. Unusually in Scotland, this degree is offered as a single honours only. In practical terms, all students must complete four years and undertake a final year honours project to receive any degree. In the design of the off campus module therefore, traditional on-campus approaches were discarded and a fresh approach applied, with the only requirement that these met the learning outcomes of the module descriptor. Given the problems listed above in teaching research methods to undergraduate students, a very simple approach was adopted. Rather than beginning with the usual ‘what is research’ and weighty philosophical arguments about research issues, the nature of reality and so on, a problem based approach was taken. The overall course design philosophy is shown in figure 3. Benson and Blackman’s (2003) model of teaching research methods around a practical approach. “An interesting and rewarding journey though the landscape of research methods that are commonly applied in business contexts”. The general design philosophy was to begin with fairly accessible ideas. Hence the student begins with their own very simple research idea. From this derives the type of literature to be searched and reviewed, the research method/methodology to be employed, the limitations of this research (i.e. the research paradigm) and the methods of analysis to be employed. It is in principle a progressive approach to which are attached concepts as and when these are required. Therefore, each piece of newly constructed knowledge is actively built on previous knowledge (Lauzon, 2000). Hence a student that begins with a research idea such as ‘what was the impact of the introduction of free bus travel for senior citizens in Scotland’, produces a research proposal at the end of the module outlining ‘a positivistic case study of free bus travel for senior citizens in Scotland based upon a quota sampled F-2-F survey analysed using SPSS’. This sounds very simple, but the ‘leap’ from one to the other is considerable. This was bridged by setting relatively short assessments throughout the course that would enable the student to slowly assemble all of the required elements of a research proposal. Although a bit overly grandiose for the author’s taste, the mission statement did communicate the sentiments of what we were seeking to achieve. Three main themes were identified as being of underlying importance to achieving this aim, which were that any learning resources to be created should be rewarding, stimulating and fun. Given the problems outlined beforehand in teaching research methods, this was particularly challenging and, as it transpired, not always attainable. It was useful however in giving some direction to the whole process. 57 link to existing resources access on-line tutorials potentially link Blackboard to software analyst products such as SPSS, SNAP and Nudist The last of these proved problematic, both in terms of the technical issues involved and the coverage of a ‘site’ licence. It was therefore decided that all such activities should be designed around software packages that students would have relatively easy access to, such as Microsoft Excel. Another possibility was the use of a research methods text that came packaged with the student version of SPSS. The text however was American and, despite offering a ready made solution to this particular problem, was not suitable for our own course. ! ! ! Jonathan Cowie teaching any aspects of the module. This runs contrary to Evans and Taylor (1996) and Murray and Savin-Baden (2000) views that most of the teaching team should be involved in the development and planning of any new course. The problem appears to be that such events are driven primarily by short term priorities, where development comes before delivery. As mentioned, this particular problem was overcome by working in ‘pairs’, hence at least one member of the pair would be a part of the teaching team. The RDTF was unquestionably an extremely useful exercise, but perhaps did not run as smoothly as it should have done. The main problem arose out of a lack of academic responsibility for this module and module development not being equated with module teaching. Both factors come down to the issue of ownership – ownership of the module and ownership of the learning resources to be developed. Despite these difficulties, the event did achieve its objectives, as it rapidly progressed the eLearning form of the module to its final completion. In its final form, the study of research methods on line was divided into seven different topic headings, which are: ! Choosing and developing a research topic ! Developing a research strategy ! Initial thoughts on collecting research data ! Project organisation and administration ! Interacting with people ! Surveys ! Identifying differences The final stage was to bring in ‘reality checkers’. Essentially this group was made up of colleagues and research students who went through the various units of the course to check for ease of use, legibility, ease of understanding etc. Several minor points arose out of this, such as fully integrating some of the course materials, but these were easily correctable. supplemented by e-Learning activities that will be drawn from the e-Learning form of the module. A final point of reflection already touched on is the issue of staff. It is worth repeating that this project had the good fortune of a strong core of committed staff at the centre of the project. These individuals brought enthusiasm and direction to the project, and made things happen through innovative approaches to research methods that space prohibits giving examples of. When undertaking any such project such as putting business research methods on line, there can be a tendency to focus on the technical issues, but the critical factor to success is undoubtedly the human aspect. People make technology work. References Azar, S. (2001) “Problem-based learning – challenges, barriers and outcome issues”, Saudi Medical Journal, Vol 22, pp389-397. Benson, A. and D. Blackman (2003) “Can research methods ever be interesting?”, Active Learning in Higher Education, Vol 1, pp39-55. Evans, P. and D. Taylor (1996) “Staff development for tutor skills in problem based learning, Medical Education, Vol 30, pp356-366. Jonathan Cowie Forsyth, I. (2001) Teaching and Learning Materials and the Internet, Kogan Page, London. Kaufman, D and D. Holmes (1996) “Tutoring in problem based learning: perceptions of teachers and students”, Medical Education, Vol 30, pp371-377. Lauzon, A. 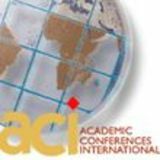 (2000) “Situating cognition and cross borders: resisting the hegemony of mediated education”, British Journal of Educational Technology, Vol. 30, pp261-276. Lennon, K. and G Roberts (2003) “On line education in Management”, paper nd European presented at the 2 Conference on E-Learning at Glasgow Caledonian University, 6th November 2003. Murray, I. and M. Savin-Baden (2000) “Staff development in problem-based learning”, Teaching in Higher Education, Vol 5, pp107 – 126. NTL (2003), HTML Basic Tutorial, Web page (http://www.ntlworld.com/help/general Help/HTMLTutorial.html, accessed on 9/9/03). Salmon, G. (2001) E-moderating: the key to teaching and learning on line, Kogan Page, London. Salmon, G. (2003) E-tivities, Kogan Page, London.